To use Dashlane on your Android device, you can either download and install our app or access your password via the Web app. 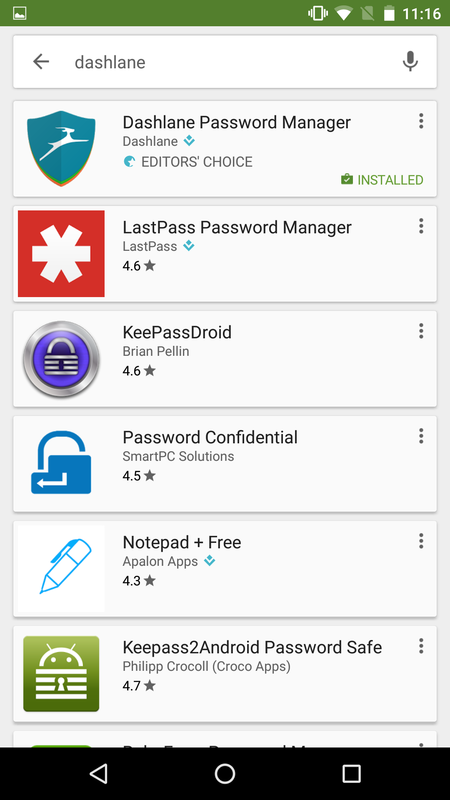 Dashlane for Android can be downloaded directly from Google Play. Please check the minimum requirements to install and use Dashlane. You need Android 5.0 or higher to be able to install the latest version of Dashlane from Google Play. If you use Android 3.#, you can still download Dashlane from Google Play, but not the latest version available. That means you will not have access to our most recent features. On Dashlane for Android, you will be able to access and edit all your password as well as the rest of your data (IDs, credit cards, etc. ), automatically log in to your favorite apps and use our Dashlane browser to log in to your websites. Find more information here. Our Web app also works on any mobile device. You can access it by following this link, or by going to the Dashlane homepage and clicking on log in. Bookmark it or add it to your home screen, for faster use! For more information on our Web app, please read this section.